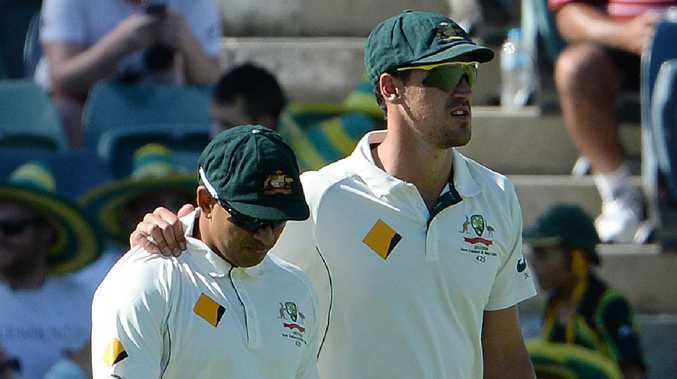 Australian batsman Usman Khawaja and bowler Mitchell Starc. Australian coach Justin Langer has reiterated his support to under-fire duo Mitchell Starc and Usman Khawaja ahead of the second Test against Sri Lanka at Manuka Oval. While there were a number of excellent performances in the crushing first Test win over Sri Lanka at the Gabba, strike bowler Starc and top-order batsman Khawaja continued their disappointing summers. And with only one Test to go before August's Ashes opener, there are mounting concerns over whether the pair should be in the XI to take on England at Edgbaston as Australia attempt to claim the urn abroad for the first time since 2001. Starc finished with the match figures of 2-98, but went wicketless in the second innings as Pat Cummins and debutant Jhye Richardson ran through the Sri Lankan batting line-up to see Australia race to an innings and 40 run victory inside three days. While his pace remained high, Starc struggled to swing the ball and was pulled from the attack early after wasting countless deliveries late on day two and early on day three as Australia looked to put the final nail in the Sri Lankan coffin. His frustrations came after earlier taking his 200th Test scalp on day one. As Australia readies for their final Test of the summer, Starc has 15 wickets at 36.46 from five matches which is well below his average of 29.11. Although his teammates are rallying around Starc, former Australian leg-spinner Kerry O'Keeffe was one of a number of experts who held concerns for the Australian spearhead. "I think Starc's most at risk (ahead of the Ashes)," O'Keeffe wrote for foxsports.com.au. "He's lost the flying saucer, he's lost reverse swing. "The ball didn't reverse for him this summer and that's his weapon. If he's swinging those flying saucers at 148km/h with the new rock and tailing it away from the right-hander with the old one, he's a force. But we haven't seen a lot of that in a while. "And unless you're precise against England, they'll work you for runs and he's lacked precision. "This is a bloke who's got 200 Test wickets. But where is his Test career at? He's not like a Glenn McGrath because of his trajectory. Starc is a sheer pace bowler and a swing bowler and if he loses a bit of pace and he doesn't swing it..."
Langer went some way to admitting that Starc was below his best by saying, "we can't be on top of our game all the time", but spoke of the left-armer's importance to the side. "There's a lot of talk about Mitchell Starc but in a game like this when you've got a guy like Jhye Richardson, Pat Cummins bowling fast outswingers, good bouncer, to have that left-arm option (is vital)," Langer said. "He just got his 200th Test wicket remember, so 200 Test wickets, that's rare company. "I suppose there's high expectation on him but he's a very good player and is really important for our team." Khawaja, too, is in need of some runs against Sri Lanka to firm up his spot ahead of the Ashes. The left-hander began the season as the side's premier available batsman, a status reaffirmed by his remarkable match-saving century in the UAE against Pakistan. But since cracking 171 at the SCG in the final Ashes Test more than a year ago, Khawaja has averaged just 31. This summer that average slumps to just 26.12, after his ugly dismissal late on day one where he chopped on for 11 off the bowling of Dilruwan Perera. And with former captain Steve Smith and opening batsman David Warner expected to slot straight back into the top order against England once completing their year-long bans, Khawaja's spot in the team is even more perilous. Similar to the defence provided for Starc, the Australian coach said Khawaja was a levelling head in an experienced top six. "Same with Usman. Still averages 40 in Test cricket," Langer said. "He's our most experienced player. He's very calm. He brings a lot of calmness and composure and experience to the group, so we're happy with the way he's going at the moment." Both Starc and Khawaja will likely need to find form in the shorter formats of the game ahead of the Ashes, with the duo likely to be used in Australia's one-day World Cup defence.